When space is at a premium, our stunning 100% hardwood small sideboards are the ideal solution to create extra space while offering plentiful storage. It's no wonder why our small sideboards are such popular pieces of furniture. They're incredibly versatile, offering you space-saving storage in a beautifully designed piece. 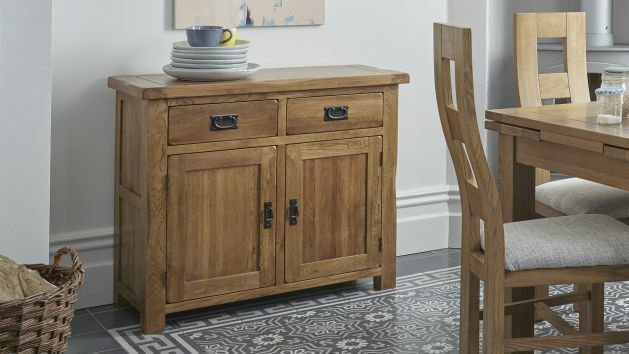 All our small oak sideboards are made using only 100% real hardwood using traditional carpentry techniques, so you know you are investing in high quality furniture that will last a lifetime. The drawers all feature solid hardwood bases, backs, and runners, and even the back of the sideboard is made from solid wood. We never use inferior materials in any of our furniture. The drawers also boast dovetail joints for added durability, and the handy cupboards mean you can have quick and simple access to your belongings. Check out our full range of compact sideboards above. With pieces to match all of our furniture ranges, you're sure to find something you love in solid oak, exotic mango, painted hardwood, or many other styles.